Fiberglass insulation in a crawl space tends to soak up moisture and humidity, goring mold and eventually causing it to "drip" off the ceiling. And even when it's where it belongs, wet fiberglass is a poor insulator. Crawl spaces narrow structures installed directly into the dirt under your home. As such, they tend to soak up the natural cold of the earth around your home and transfer it into the air in your crawl space. If you have utilities in your crawl space such as your water heater, furnace, or hot water pipes, your energy bills will suffer. This cold will bombard your utilities, forcing them to work harder just to maintain status quo. At Best Home & Property Services, we can upgrade your crawl space's energy efficiency with products that are durable, long-lasting, and made especially for the crawl space environment. Contact us today for your crawl space insulation quote! Contact us today for your crawl space insulation quote! 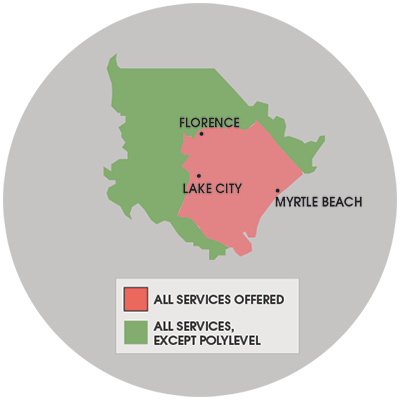 We serve Myrtle Beach, Sumter, Florence and many surrounding areas, including Georgetown, Hartsville, Conway, Lancaster, Darlington, Bennettsville, Camden and nearby. TerraBlock™ is a unique, durable crawl space insulation and liner in one. It's the first insulation product created specifically for rough, uneven crawl space floors, which can be as cold as 55 °F. Made for floors and walls alike, this provides a puncture-resistant, padded solution for your crawl space. And because of its design, it will hold up to the damp, and sometimes wet, environment. If you've already decided to repair your crawl space and install a liner, this is the product for you. TerraBlock™ provides energy savings and moisture protection at the same time! Installs On Walls & Floors -- TerraBlock™ is appropriate for crawlspace walls and floors. However, intricate details will need to be wrapped with our CleanSpace® Vapor Barrier. Compatible With Our CleanSpace® System -- TerraBlock™ can be used as a standalone product, or it can be combined with our drainage matting, radiant heat barrier, or other products.